This role is responsible for all issues in the assigned area related to baggage handling operations on a shift basis. Responsible for ensuring safe, efficient and smooth baggage handling operation in the assigned area from customer experience, OTP and equipment, systems & facilities availability and reliability perspectives. Responsible for providing supervision, guidance and support to assigned stakeholders on a shift basis. 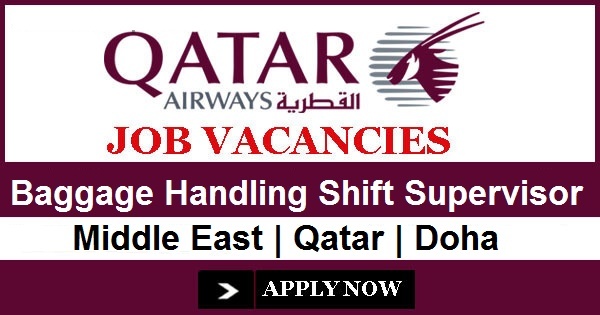 • Supervise the delivery of the baggage handling operations for Hamad International Airport ensuring a first class service is provided. • Ensure that management instructions, company policies, and standard operating procedures are followed and implemented. • Ensure that manuals, process descriptions and procedures are updated and are in line with international and national regulations and companies policies. • Provide relevant stakeholders staff with supervision, guidance, and support in live operation to ensure safe, efficient and smooth baggage handling operation in the assigned area from customer experience, OTP, and equipment, systems & facilities availability and reliability perspectives. • Execute emergency protocols within the baggage area as defined in the Airport Emergency Plan. • Attend to and resolve problems related to baggage handling. • Identify and escalate risks and/or operational deficiencies, and implements effective solutions. • Study, compile, and analyse statistics reports to identify and escalate risks and/or operational deficiencies, and implements effective solutions. • Update and inform through reporting channels of necessary modifications or enhancements with supporting justifications to the processes, facilities and systems relating to baggage handling and hold baggage screening operations. • Monitor and control outsourced contractors’ staff and performance including time and attendance and service levels. • Provide guidance and support to the execution of agreed regular maintenance activities in accordance with BHS and HBSS provider guidelines. • Ensure safe operation of all baggage handling equipment and systems including ancillary facilities. • Ensure compliance with all standard operating procedure for baggage handling and related facilities. • Liaise with Scheduling Operators and contractors to ensure adequate and efficient resources allocations including system availability and other operational requirements. • Liaise between HIA, appointed sub-contractors, the handling company and carriers, HIA departments, and relevant stakeholders to resolve baggage related issues and problems and to ensure seamless operations and coordinate the best balance between operational and maintenance requirements. • Ensure production of baggage handling statistics for the HIA management team. • Ensure production of incident reports, shift reports, and safety reports for HIA management team. • Any other projects, tasks and responsibilities as assigned. • Bachelor degree in Engineering, Computer Science or related fields from accredited University or Vocational School Diploma in related Technical fields from accredited Institutes with additional 4 years of relevant work experience. • At least 1 year of operational experience in a similar role in a hub airport with in-line HBS; or over 1 year of experience in a supervisory role in an airport, airline’s ground services or ground handling company; or over 2 years of experience in T&C or O&M team of BHS in similar sized airport. • Experience with in-line baggage screening system operation is preferred. Job Specific Skills: • Good knowledge of IATA requirement related to baggage handling operation. • Good IT Knowledge with expert level MS Excel skills is a must. • Knowledge of EDS equipment operation and maintenance is preferable. • Knowledge of SITA’s Bag Message, Aring’s BagLink TM, and Quantum BRS, CUTE and / or DCS is preferable. • Must be fluent in both Arabic and English, written and verbal. • Able to conduct Operation Training in English. • Requires in-depth knowledge of operational working practices and decision mechanisms. • Must have a high degree of self-motivation with the initiative and drive to achieve results. • Service oriented with good analytical with solution oriented, negotiation and decision-making skills. • Represent HIA BH department management on a shift basis. • Must be able to work as a supportive member of a team in a cross-cultural environment. • Basic Aviation rules and regulations.